A school etching press for manual chalcographic printing (copperplate intaglio printing), suitable for school use and for beginners, made in Italy by Fome. Able to print up to a maximum of 22cm wide paper. Solid steel rollers with adjustable height. Supplied with metal plate and a 3mm felt matt. Please Note: The manufacturer recommends to attach this press to a table so you can get enough leverage for proper printing function. Jackson's also stock a replacement FOME 3mm Felt Mats. Q. Can this press be used for lino and woodcut relief printing? A. 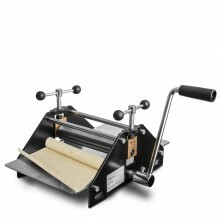 This etching press can be used for relief printing. However please note, the maximum thickness of the lino or woodcut cannot exceed 1.7cm.